Why is a resume important? If you’re looking for resume rewording, then you may also be interested in bettering your application. That’s a good move. A resume is your main weapon to introduce yourself to the prospective employer and hiring manager. Your resume is your chance to shine and show that you deserve to be called for an interview. Stay tuned to this guide to learn paraphrasing a text, which can also one of the ways of customizing your application to suit the job. Rewriting your resume is important. It lets you adjust your current resume to make it suitable for the job. It will help you gain more chances to succeed in the application because you can also tailor it based on the job posting. It can contain the right keywords contained in the requirements of the employer. A customized resume also helps you show that you have read and understood the posting. In that case, you can show your attention to details even without writing that in the CV or resume. By tailoring your CV, you also have the chance to capture the attention of the employer because you can include strong related words to clue him that you have the skills and qualifications required for the position. Before applying for a job, you may want to know about these statistical facts so that you will have an idea about how to write your resume or why you need to customize it. Check them out. In the United States, three million jobs are unfulfilled and there are 11.8 million unemployed. When you include your photo in the CV, there is an 88% chance of being rejected. Resumes with unprofessional email addresses are rejected at a rate of 70%. 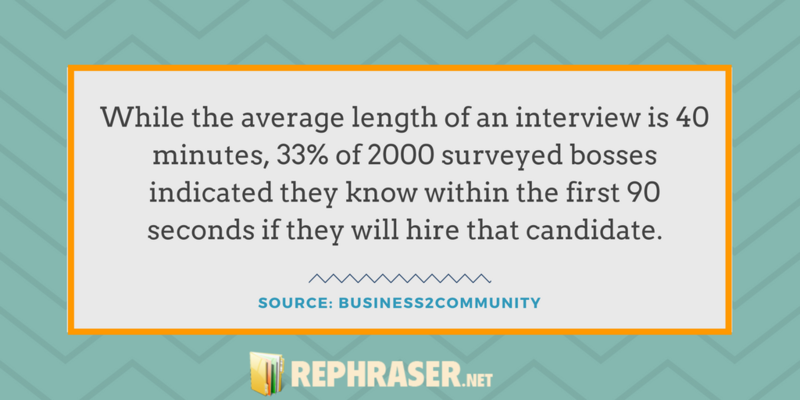 Five to seven seconds is the only time spent by recruiters in reading resumes. Did you know that only 35% of the applicants are qualified in the companies or job positions to which they are applying? Every week, there are 427,000 resumes posted on Monster. According to Robust Resumes and Resources, recruiters review resumes based on criteria, which include keywords extracted from the description. Most of the companies are now also using ATS or applicant tracking systems in scanning the resume. These are looking for the inclusion of those keywords. That’s why applicants should include keywords in their CVs or resumes if they want more exposure for their application. According to the same source, a job transition can also last for several months. A professional resume rewriter knows what words to add and what words to avoid in your resume. He or she will come up with an impressive customized resume that will work and fit your qualifications to highlight them well. The following are the words that the professional resume rewriter will not include in your application and why. Reference available by request: It is another term to avoid in your resume if you want to make it work. This term does not add value nor show your fitness for the job. Omit this term if you want a well-written application. Responsible: ‘I need help rewording my resume’ If you are looking for tips on how to make a better resume, you must avoid this term as well. It looks like you are an uninspired employee that only knows how to fulfill the job requirements. Instead of it, show your talent, skills, and qualifications by highlighting your achievements and accomplishments in the previous position. Instead of this term, you may want to replace it with action words such as managed, led, supervised…. Team player: If you have succeeded in collaboration, then write details about it. Don’t use this term or ruin your job application success. Problem-solving skills: This sounds a cliché. Everyone knows how to solve a problem. Instead of wasting space in your resume with it, why don’t you include data on how you solved a problem such as lowering operation cost or increasing company sales? Detail oriented: This is another cliché in the resume. Avoid this hackneyed term in your resume. Instead of writing it, why don’t you include evidence that you are detail oriented? For example, how did you oversee your team working on a complicated project? Salary negotiable: Making an impression, you must avoid this term in your resume. You will be wasting space in the application for including it. The term reads like padding your resume and shows that you have nothing much to add. Why these words? Your resume should show what you have done in your previous work which means that you need to describe your skills or the results of your knowledge rather than tell your readers. By using the list of the words above, you are showing potential employers what you can do for them as well. Our resume reworder ensures that your application is matching to the requirements of the job, as per the job posting. In that case, they can make sure that your resume contains the right keywords and do not contain the terms highlighted above. They also know how to make your resume work because they can highlight your skills, qualifications, and knowledge for the job. Their experts know how to paraphrase online, but they do it manually. In that case, they can apply the correct rules in rewriting. They will not just change words into their synonyms, but they will use the correct words to strengthen your application. There you have what to know in rewriting resume to keep in mind and apply when paraphrasing. Now if you don’t know how to do it yourself, you must not think twice but get help from the experts at our services. Finding the rights words to use on a resume won’t be easy especially if you are not fully aware of what employers are looking for when reviewing resumes. 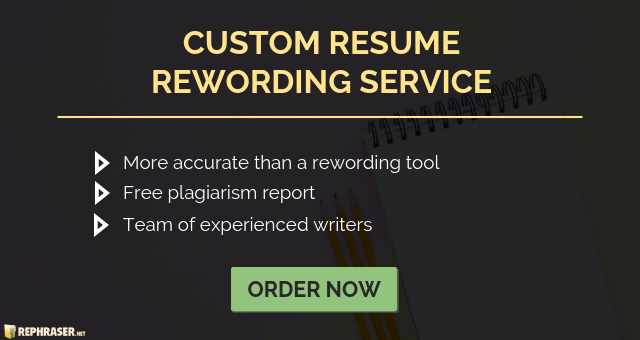 If you feel that your resume will need more work, don’t hesitate to hire our rewriting service because our writers know how to create a better sounding resume where it shows your skills and experiences rather than tell. When you place an order with us, we’ll immediately assign a writer who can rewrite content while integrating essential keywords that are relevant to the job so that the HR team will be able to spot you even at a glance. Additionally, if you want to paraphrase some paper get a better grasp of content rewriter software and is it trustworthy enough! Use our writing service today and we’ll show you what words to use on a resume to stand out!